In this tutorial, we will guide you on how to use Voice Changer Software 8.0 (Diamond Edition) (VCSD8) for changing your voice when you are on Google+ Hangouts. 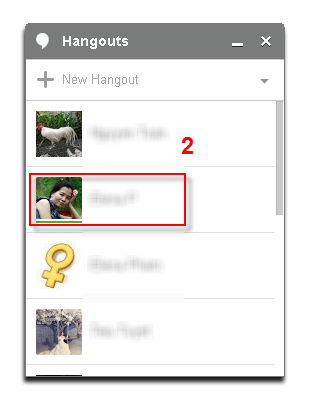 » What is Google+ Hangouts? Google+ Hangouts is an instant messaging and video chat platform developed by Google, which launched on May 15, 2013 during the keynote of its I/O development conference. It replaced three messaging products that Google had implemented concurrently within its services, including Talk, Google+ Messenger, and Hangouts, a video chat system present within Google+. * You need to have Google+ Hangouts installed on your computer. On VCSD8 main panel, click Preferences to open Preferences dialog box. In Preferences dialog box, we will switch from Hook mode to Virtual Audio Driver mode. - Check on Virtual driver Mode (1). - Click OK (2) to apply the new setting and close Preferences dialog box. 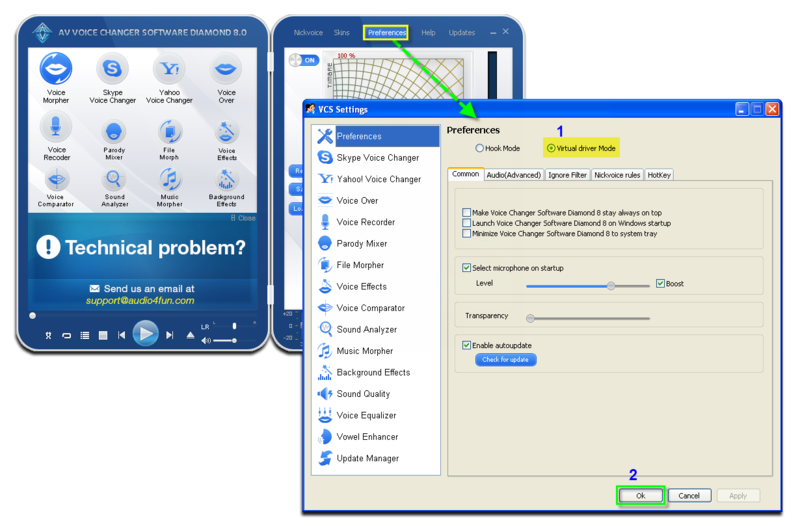 Open Voice Changer Software 8.0 (Diamond Edition), choose morphing effects and make adjustments for your voice until you achieve desired voice output. Click here to learn how to change voice using Voice Morpher feature and other voice changing task that Voice Changer Software 8.0 (Diamond Edition) can do. - Log into your account (1). - After successfully logging into your account, double-click on a friend in your contact list (2). 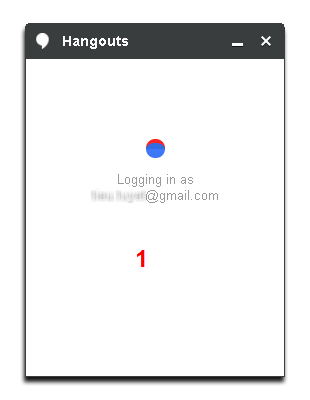 - Message dialog box will come out, click on Video call button to start a conversation (3). 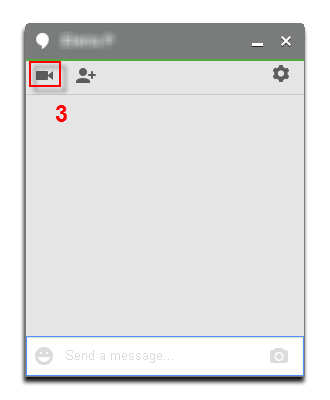 - When Google+ Hangouts dialog box appears, click on Setting icon (4) at the top-right corner. 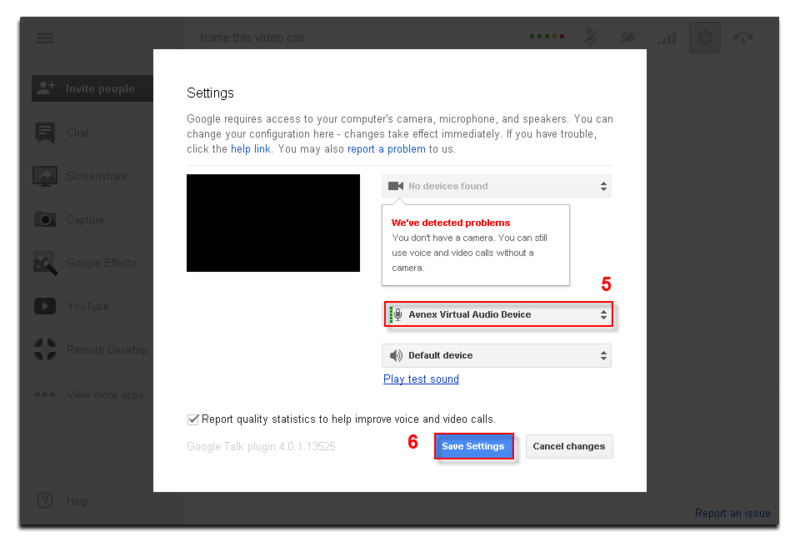 - In Settings window, change Microphone Device to Avnex Virtual Audio Device (5). - Then click Save Settings (6) to apply the change and close this window. - Now, the morphing effect will be applied automatically. You can now start the voice chat session on Google+ Hangouts with a completely new voice. Note: Please notice that as long as the Voice Changer Software 8.0 (Diamond Edition) is On, the morphing effects will be applied to your voice automatically. To change it back to your normal voice, just turn off the voice changer software.